Cosmetic Dentistry is a specialization that can make teeth look new again and maybe better than ever. These cosmetic procedures are very popular today and they can help fix an old smile. These Cosmetic procedures can help with chipped, discolored, odd shaped or even missing teeth. Procedures like the bleaching of the teeth can make a big difference in social situations. Cosmetic Dentistry can fix any irregular look to the teeth. They can help with all cosmetic dentistry needs making it ok to smile again. It is amazing what they can do. Porcelain veneers are incredibly thin custom-made shells that are usually designed to cover the surface of teeth. They are teeth-colored and their usual usage is to improve the appearance of a person’s smile. These shells are adapted to the front of the tooth taking the same color, shape, length and size of the tooth they are applied to. Porcelain veneers resist staining pretty well and mimic light reflecting properties that teeth have incredibly well so they appear to be natural on the teeth. They are able to fix a few problems on your teeth. Porcelain veneers are usually used to fix broken or worn down teeth, chipped teeth, irregularly shaped teeth or gapes between teeth and teeth that are discolored. These are mostly aesthetic issues but solving them can help improve the self-confidence of a patient. Porcelain veneers have numerous advantages, the main one being that they provide a natural tooth appearance. On top of that, gum tissue tolerates porcelain fairly well and as such, veneers are an incredibly good way of whitening the color of a tooth and improving its general appearance. The process of applying a porcelain veneer is, however, irreversible. If you choose to apply one you cannot remove and it is incredibly hard to repair a veneer should it chip or break. Moreover, although unlikely, it is possible to have a veneer fall off or dislodge. Habits such as chewing on ice, biting nails and chewing pencils need to be avoided. Finally, porcelain veneers usually last between 5 and 10 years, depending on the amount of pressure you apply on your teeth. Before getting a porcelain veneers, it is advisable to see your dentist and confirm that they are the best option since veneers are not a good choice for individuals with unhealthy teeth as they make the teeth more sensitive. If you are unhappy with your smile, please contact us to reserve your complimentary smile analysis. We look forward to meeting you soon! 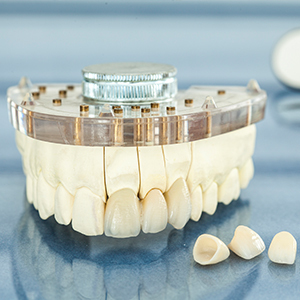 Whenever people need dental crowns they are now starting to go with zirconia crowns instead of any other material, mainly because of the many advantages zirconium has over other types of material such as gold when it comes to dental crowns. The advantages of zirconium (used in zirconia crowns) is that it is incredibly tough and resistant – it can withstand the natural wear and tear it will be subjected to; it is translucent which gives it a similarity to natural teeth; it has no fuse; it is biocompatible and finally its size, shape and color are easily modifiable. Even though zirconia crowns have a variety of advantages, the biggest one of them is that they are aesthetically superior to any other type of dental crown. They are incredibly similar to natural teeth and as such people will usually not be able to tell the difference between a dental crown with zirconium and a natural tooth. Since zirconium can be easily modified, these crowns can be used for any part of the mouth including the frontal teeth and the person using them does not have to worry about being seen as different because the crown is going to be unnoticeable to a certain extent. Zirconium crowns are better than gold and porcelain crowns, mostly because people do not like to have metal inside of their mouth and both of these crowns require it. Gold crowns have it because, well, they are made out of gold. Porcelain crowns on the other hand need a metal fuse attached to them which is usually black and that ruins them aesthetically. On top of that, porcelain crowns chip and break easily when compared to zirconia crowns. The price of a zirconia crowns depends a lot on the dentist and on your area, but you can usually expect to pay around $1000 per crown in the United States. If you would like more information, or are interested in scheduling an appointment, please contact us today. Gum reshaping, otherwise referred to as gum contouring, is often considered cosmetic dentistry. Many people will have straight and symmetrical the, but it is diminished because their gum line falls too far below the lip line. The gum may even be uneven, which can lead to a person becoming unhappy with their smile. Dentists will often referred to gums that extend too far below the lip line as a “gummy” smile. The best solution then becomes gum reshaping. In the past, gum reshaping was done with a scalpel, which lead to bleeding as well as a long and uncomfortable recovery. New technology has made it possible to offer gum reshaping that leads to a virtually painless procedure as well and they fast recovery. Dr. Viceo will uses electro-surgery so that patients can experience perfectly sculpted gums so that they are able to accept their smiles faster than ever before. A local anesthesia is applied prior to the electro-surgery process. This will help to eliminate any kind of discomfort for the patient. The electro-surgery process removes excess gum tissue and sculpts the gum line so that it is more uniform and scalloped. There may be some swelling or soreness following the gum reshaping procedure. This generally takes no more than a week in order to recover from. It will not interfere with any daily activities, including eating, drinking, or speaking. The only thing that should be avoided is eating foods with seeds or anything spicy several days following the surgery. With the new technology, gum reshaping can help people to gain a better smile without having any issues with gums standing in the way. Contact us today to discuss how we help you achieve your ultimate smile!